Any travel lover who is thinking about visiting Iran may ask themselves when the best time to visit Iran is. Well, the question can be answered from different points of view. One is the weather and climate in Iran and the other is Iran holidays and festivals. Regarding the first aspect, it should be mentioned that Iran’s climate is curious. Maybe those who do not have enough information about Iran, think that all regions in Iran are the same in a single time of the year. But this is not the point. The truth is that during any time of the year, there is a place to visit in Iran without having any trouble with the weather. The only thing you have to know is which place to visit in which time of the year. The desert areas lie in the east and the center of country. Great mountains lie in the west and southwest of Iran. Also there are some mountains in the east. Green jungles and the Caspian sea can be seen in the north whereas Iran’s southern shores have a climate similar to the tropics. Spring is one of the seasons chosen by many for visiting Iran. Based on where you go, the weather varies from pleasant warm to mildly cold, and this period usually enjoys much rain. the two final weeks of March, coincide with Nowrouz (Iranian New Year) holidays. Many Iranians choose this time to travel. So if you are not fond of crowded places, you can wait till the 13-day period of Nowrouz finishes and then come to Iran. But if you like to see the festivals and beautiful traditions of Nowrouz, you may enjoy this time of the year as well. however, putting aside that short period, Iran is perfect for a visit in spring. 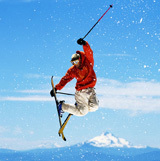 You may even get to go skiing in Ardabil‘s Alvares, Tehran’s Dizin ski resorts, or Sepidan Ski resorts near Shiraz. Provinces such as Fars and Khuzestan—in southern and southwestern Iran respectively— which are mostly hot during summer, are so cool in spring that you definitely enjoy their cultural and historical heritage. cities like Shiraz, Yazd and Isfahan are best chosen as travel destination in April and May. May is not only one of the loveliest months to visit in terms of climate, but also it is the time Iran’s landscape blooms. Flowers light up the landscapes, one of the prettiests of which are bell-shaped crown imperials. Do you always associate tulips with the Netherlands? You may change your mind, because tulips are the national flowers of Iran, and the symbol on Iran’s flag features the name of Allah which resembles a tulip, in memory of those who gave their lives for their country. You can see these pretty flowers during Spring in Iran. Summer is usually considered as a hot season, but do not worry. There are still places in Iran which have pleasant weather during summer and you can easily travel through them. 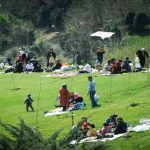 Ardabil and Gilan provinces in northwestern Iran, Kurdistan Province in the west and Chaharmahal-Bakhtiari Province in south-central Iran are the best to choose for travelling in summer. 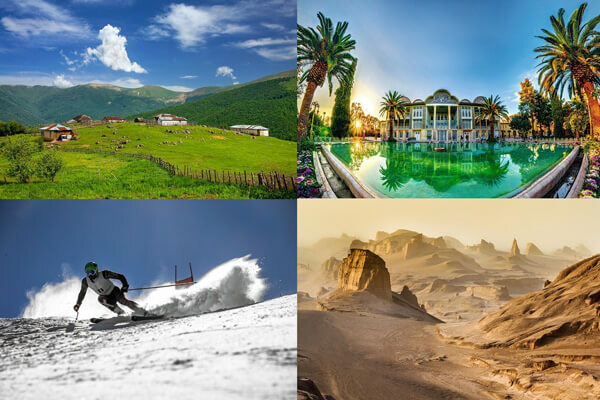 In general, western and northwestern provinces of Iran are popular destinations this time of the year. But if you are a fan of deserts, you should wait till the beautiful season of autumn arrives. Fall is a great time to travel to Iran for the fact that trips are a bit more spread out than other popular periods. And also hotels offer better prices during this season. the weather begins to cool down in many places and the first place for this happening is the northern and western areas of Iran. But, you have a great chance to visit the places everyone wishes to see. The deserts of Kerman, Yazd and South Khorasan are among interesting locations to visit in Iran during fall, particularly for those who want to have a clear look at the Milky Way. Make sure to visit Lut Desert and also Shahdad Desert; the former is a World Heritage Site. Shahdad is the hottest spot on the planet and yardangs, (known as Kalouts in Iran) can be seen in this place. But being hot in summer, this is the best place to visit in Fall. Don’t miss this unique must-see. Also Fall is also one of the best times of the year to visit central Iran, specially Isfahan and Shiraz; two great historical cities having 7 world heritage site! In Isfahan you can see the Jame’ Mosque and Naqsh-e-Jahan Square, and also ancient qanats and Chehel Sotoun Garden, which is in the World Heritage List. Eram Garden is one of the places to be visited in Shiraz. Pasargadae and Persepolis are also located outside the city of Shiraz which are a must for everyone who want to travel to Iran. Winters in Iran can be pleasantly cool in some great cities and of course very cold in some others. Southern regions are typically warm in winter! Central provinces may have temperatures near zero from time to time, but it doesn’t necessarily snows during this time in this cities. Western and northwestern areas can have snowfalls during winter. But the good news is you can choose the south as your travel destination because you can even go swimming there in winter! Temperatures in Hormozgan Province and Bushehr are high enough for swimming. Can you imagine swimming in February?Also, winter is an excellent time to travel to Persian Gulf islands of Kish and Qeshm. Remember these are free trade zones which you can enter without visa as well. 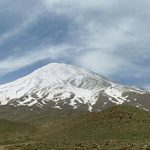 Skiing can be also one of the choices in this season, especially in Tehran, Shiraz and Ardabil, as both have popular ski resorts (Tochal and Dizin in Tehran, Alvares in Ardabil, pouladkaf in Sepidan, near Shiraz). Other provinces such as Alborz and East Azarbaijan also have ski resorts, so you have a fair long list of destinations to visit. As you see, in any season of the year, there is a great city in Iran to visit. 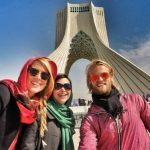 So before deciding to visit Iran consider your personal preferences and then whatever your preference is, there is a place to visit in any time. 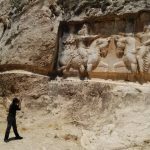 As a whole, Spring (mid-April – beginning of June) and fall (end of September – beginning of November) can be the best choice if you wanna have a classical trip to Iran. Besides considering the climate, you may also be concerned with the occasions and holidays, as a factor for your travelling. 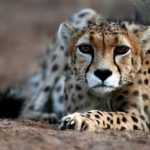 You’d better have some information about Nowrouz, as mentioned before. And also you should consider Ramadan which is a month-long event in the Islamic calendar. In 2018 it begins on 15th of May and in 2019 on May 5th. During Ramadan, it is forbidden to eat or drink in public between sunrise and sunset – although some restaurants may serve foreign tourists. You can also eat in private or in vehicles. After dark, be prepared for feasting. 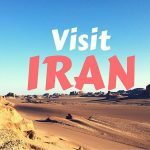 If you want more information about Iran holidays, click here. Iran Destination, a well-known Iran Tour Operator, is a good choice for getting any Iran travel service. you can review our Iran tour page and also customize a tour in our Iran tailor made tour page.